Galaxies churn out new stars all the time, but most of the universe's stars formed between two and six billion years after the Big Bang (which occurred 13.8 billion years ago). 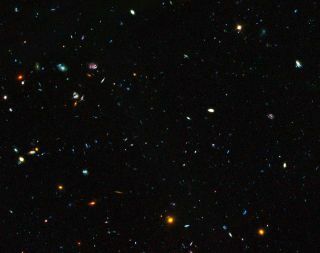 The new Hubble observations capture the prolific dwarf galaxies, which are known as "starburst galaxies," during this dramatic epoch, researchers said. You can watch a video explaining the new dwarf galaxy observations . "We already suspected that dwarf starbursting galaxies would contribute to the early wave of star formation, but this is the first time we've been able to measure the effect they actually had,"study lead author Hakim Atek, of the École Polytechnique Federale de Lausanne in Switzerland, said in a statement. "They appear to have had a surprisingly significant role to play during the epoch where the universe formed most of its stars," Atek added. The distant dwarf galaxiesthat the Hubble telescope observed are forming stars so quickly that they can double the number of stars they hold in just 150 million years. Normal galaxies take 1 to 3 billion years to do this, researchers said. Starburst galaxies are relatively rare; researchers think these galaxies generally require a powerful event, such as a supernova explosion or galaxy merger, to get kicked into star-forming gear. Hubble observed the dwarf galaxies using its Wide Field Camera 3 (WFC3) instrument, which captures images in a wide range of wavelengths. In the new study, infrared light proved key to illuminating the faraway starburst galaxies. WFC3 also has a prism, which splits light into its constituent wavelengths. The spectroscopy mode of the camera produced the images, in which each galaxy appears as a rainbow streak. Scientists analyze the galaxies' spectra to estimate how far away they are from Earth and determine their chemical composition. Previous studies of starburst galaxies had focused on nearby or large galaxies, leaving out the faraway, ancient dwarfs, which are more difficult to observe, researchers said. The iconic Hubble Space Telescope has been snapping pictures of the universe since 1990 and is part of NASA's "Great Observatories" project.